This has been an exciting period for AntClim21 with a number of activities and developments that all help to build towards the next two years. Many of our activities cut across the three science themes of AntClim21: quantification of Antarctic climate variability; climate model evaluation for the Antarctic region and Antarctic climate projections to 2100 AD and beyond. 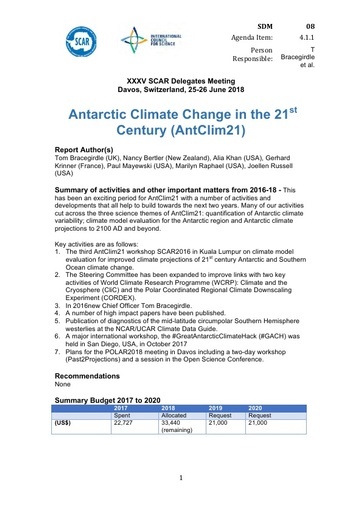 1.The third AntClim21 workshop SCAR2016 in Kuala Lumpur on climate model evaluation for improved climate projections of 21st century Antarctic and Southern Ocean climate change. 2.The Steering Committee has been expanded to improve links with two key activities of World Climate Research Programme (WCRP): Climate and the Cryosphere (CliC) and the Polar Coordinated Regional Climate Downscaling Experiment (CORDEX). 3. In 2016 new Chief Officer Tom Bracegirdle. 4. A number of high impact papers have been published. 5. Publication of diagnostics of the mid-latitude circumpolar Southern Hemisphere westerlies at the NCAR/UCAR Climate Data Guide. 6. A major international workshop, the #GreatAntarcticClimateHack (#GACH) was held in San Diego, USA, in October 2017. 7. Plans for the POLAR2018 meeting in Davos, including a two-day workshop (Past2Projections) and a session in the Open Science Conference.